Shelburne Town Hall is located at 5420 Shelburne Road, Shelburne, VT 05842; phone: 802-985-5110. Photo: Dutton House, ca. 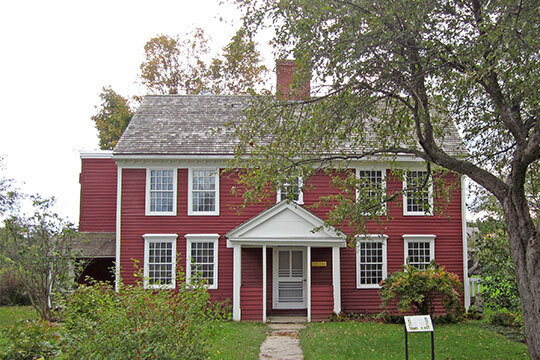 1782, moved from Cavendish in 1950 as an exhibit for the Shelburne Museum. Photographed by User:Storylanding (own work), 2012, [cc0-by-1.0 (creativecommons.org/publicdomain/zero/1.0/deed.en], via Wikimedia Commons, accessed January, 2015. It is this Native American culture that the European settlement of Shelburne impacted and displaced after Shelburne was chartered in 1763 by the State of New Hampshire. Just as the Native Americans had, the settlers learned to diversify and experiment with different agricultural techniques to survive the variable climate and harsh winter conditions as well as the changing nature of the economy. European settlers from more southern areas of the United States faced an unsettled political situation in Vermont, with a British/Native American alliance created to dispel them from trying to create farms out of the wilderness. Confrontations among settlers and these allied parties were frequent during the years before the Revolution when settlers were clearing their lands and building their first homes. Approximately ten families had settled in Shelburne prior to the Revolution. These early settlers were rather nomadic, in that many, such as the Moses Pierson family of Shelburne, traveled seasonally back to their former homes in southern portions of the state and New England, storing their large crop of wheat in Shelburne until they could come back to thresh it. The Piersons had acquired 1000 acres in the southwestern part of Shelburne bordering Lake Champlain, where they built a "block house" or, alternately, a "log house." The most outstanding example of the early transition period from Native American to European occupation and agriculture is illustrated by the battle of the Shelburne block-house after the Pierson family came back to thresh their wheat at the end of the winter. During the battle, when Native Americans and the British attacked the family in their house and tried to burn it, several people were killed, but the Pierson settlement was saved, later to become the the Meacher [Meecher] family settlement. What actually constituted this "block house" has not been explained, but a notation on the Beers Atlas map of 1869 indicates that a French blockhouse was located in this vicinity of what had become the Meechville settlement. Although early manufacturing continued to take place on local farms, the operation of a variety of mills began at the end of the 18th century that utilized the waterpower of the various streams and rivers. This made conversion of the raw products of the farm into usable materials much easier. The Village of Shelburne Falls developed as early as 1785 at the fifty-one foot falls of the La Platte River. This part of Shelburne was settled by Ira Alien, and his millwright, James Hawley, built the first sawmill and forge at the falls. The sawmill and forge were necessary for the settlers to turn the abundant timber from their farms into building materials for homes and farm buildings, as well as carriages and sleds for transportation. A gristmill to process grain was built soon after the sawmill at the base of the large falls. A carding and fulling mill were built to process wool just after 1800 at the same falls, spurring the growth of the village. In 1858 and 1869, there remained a grist mill, blacksmith shop and sawmill. Moore and Lake owned a plaster mill, circular saw mill, and grist mill, with both listed as farmers and manufacturers of lumber, flour, meal and plaster. A blacksmith shop and S. Bassford's wagon shop utilized the water of the falls on the La Platte River as well. In 1880 the Falls served a flouring mill, sawmill with a creamery, shingle mill and blacksmith shop. A saw mill was also located on Shelburne Point in 1869, near the shipyard on Shelburne Bay. The town that was once dominated by an agricultural economy has now become a desirable bedroom community of Burlington. Where once there were a few horse drawn carriages or hay wagons seen making their way down Dorset Street, now a steady stream of SUV's motor on US Route 7 through Shelburne. The farms in Shelburne have survived! numerous changes in the local, statewide and national agricultural economies. Farmers, Native American and descendants of European settlers alike, by necessity have had to constantly make changes to adapt to cultural and economic demands in the products they raise, most recently in order to take advantage of profitable markets and adjust to rising capital costs and issues such as the federal manipulation of milk prices, with the modernization of roads and automobiles, Shelburne was brought closer to Burlington. It became easier for people who worked in Burlington to commute from Shelburne. This demand for land caused the land value in Shelburne to increase and some farmers found it more profitable to sell off their land for development than continue with the rigorous existence of farm life. With the sale of farmland came an increase in housing development and a decrease in the open space. As the town struggles to come to terms with its inevitable growth, it is essential to continue to recognize, preserve, and respect the disappearing farming tradition which serves as Shelburne's cultural backbone. Deborah Noble, Principal, Deborah Noble Associates, Prehistoric and Historic Resources of Shelburne, Vermont, nomination document, 2003/2004, National Park Service, National Register of Historic Places, Washington, D.C.